Most crossovers and modern vehicles sit atop large, impressive rims. And nothing shows them off better than shiny black tires. Getting the look is easy enough, just apply some tire dressing to the sidewalls. Of course, there’s a lot of types and formulations of tire dressings, so it’s important to know what you’re looking for. Water-based silicone tire dressings have been around since the ‘70s and give a low-gloss sheen to the sidewalls. The trade-off is that they need to be reapplied every couple of days to sustain the shine. 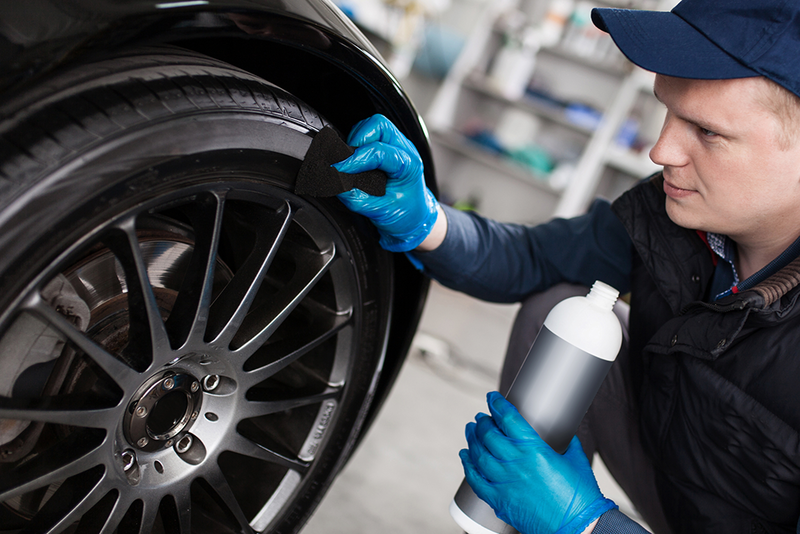 Solvent-based tire sprays first appeared on the market in the 1990s. These formulas not only give tires a glossy, wet look, but also last a week or more between applications. There’s also gels, which adhere better to rubber than earlier formulas and produce a very glossy, rich, wet-looking surface. Gels typically come with a sponge and are wiped or dabbed on. The finished look can last anywhere from a couple of weeks to a couple of months, depending on driving conditions. The rise of wet-look tire products coincided with a sharper focus on vehicle wheels and tires. As minivans evolved into SUVs, tires grew larger and flashier. Custom wheels became popular—and if you were spending a lot of money on fancy rims, you wanted shiny black tires to show them off. The latest innovation in tire dressing is the “wet wax” formula, which is estimated to last eight to 10 weeks. It is applied with a sponge, just like the gels, but gets drier to the touch than other formulas. Do tire dressings actually protect tires or just make them look good? But appearances matter, and tire dressings come in a variety of styles to suit your tastes. Apply to clean, dry tires. The tire dressing will adhere better, last longer and look better. For water-based silicone emulsion sprays, spritz the product onto the tires and wipe it evenly across the surface with a clean rag. These products are less potent, and may require re-application every couple of days, depending on the weather. Solvent-based sprays last longer—generally a week or more—and produce a slicker, shinier surface. Gel formulas applied with a sponge are more precise—no overspray onto the paint, wheels or driveway. Let dry. Let the liquid or gel formula set dry at least an hour, and overnight is probably best. If you don’t let it dry long enough, or apply it too heavily, it may “sling” onto the rocker panels at the outer edge of your car’s underbody when you drive. Wax-based tire dressings produce the longest-lasting wet-look shine (eight to 10 weeks) and also dries faster than liquids or gels.